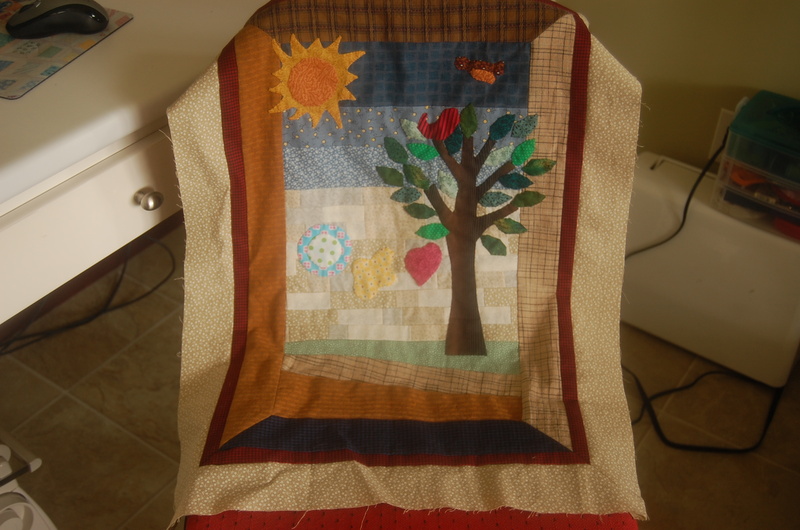 I was going through my studio closet today and found this little quilt top that I had made three years ago. I have it all marked to quilt. It has a little bit of everything on it. Embroidery, applique and piecing. I doubt if I get to it this year as I will be working hard to get a new inventory ready for the 2018 art shows. I had forgotten how cute it was. I had no pattern for this, it was all trial and error. The words around the edge are: Be Happy, Follow your Heart, Show Kindness, Find Bliss, Love Yourself, Take Care of the Earth, Hugs are Good, Stop and Smell the Flowers, Dance. My friend, Karla from Kansas City Mo, was making mittens to sell at craft fairs for Christmas. I asked her if she would make me a pair also, and they are so beautiful. The yarn is so soft and the embroidery is fantastic. What a work of art! I follow an artist who has named her business Soul Whisper Arts, she was offering a bundle of items so I treated myself to them. This is one of her prints that was included. It is precious and is called “up, up and away”. This painting I finished right before I did the Louisville show in October. I did not have time to scan it and add it to my Etsy shop. Today I did that. It takes a bit of time to do one that is this big. The size is 20 X 40 and it doesn’t fit on my scanner. It has to be scanned in pieces and then the computer magically puts it all together. 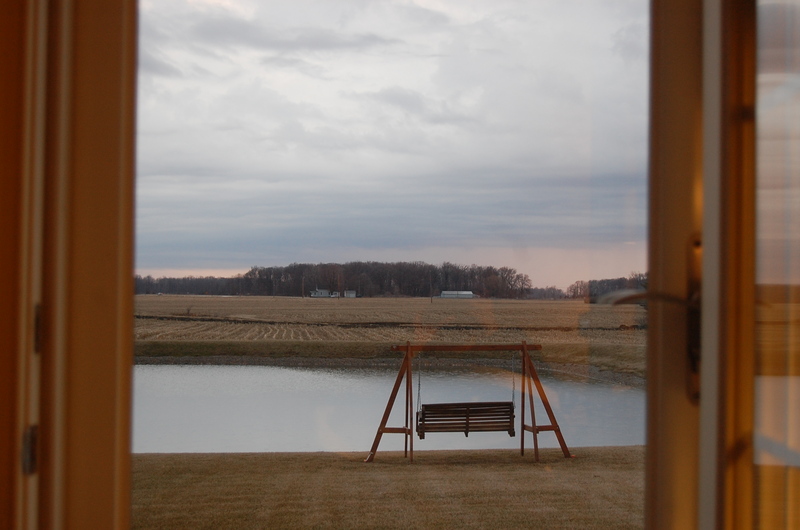 I wanted to depict Kentucky with the horse farm and the white fences and the tree lined driveway. I also added a Ford Super Duty truck because they would need that to pull the horse trailers and also there were two Ford Factories in Louisville. 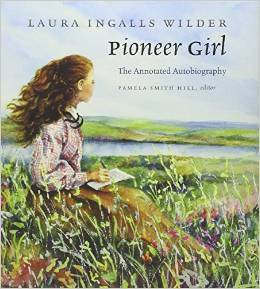 The title of this painting is “Home” and the quote that I have used is by Laura Ingalls Wilder…HOME is the nicest word there is. This painting is for sale and also prints can be purchased in my Etsy shop. If you are interested send a message to me. Last night I went to a play with my sister at the First Presbyterian Theater. I had not been there before and it was a really nice surprise. 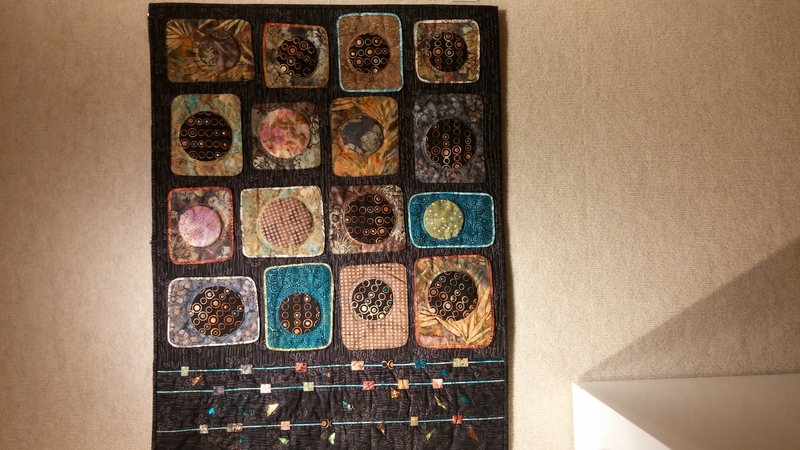 Not only did I see a very good play but they also have a gallery and a one person quilt show was up. 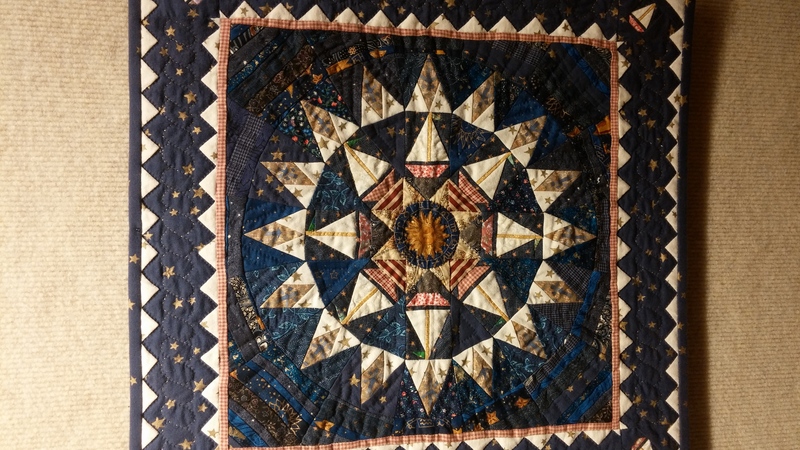 These next few pictures are some of the quilts that were there. Each piece of work was as good as the next. She was a wonderful artist and seamstress. 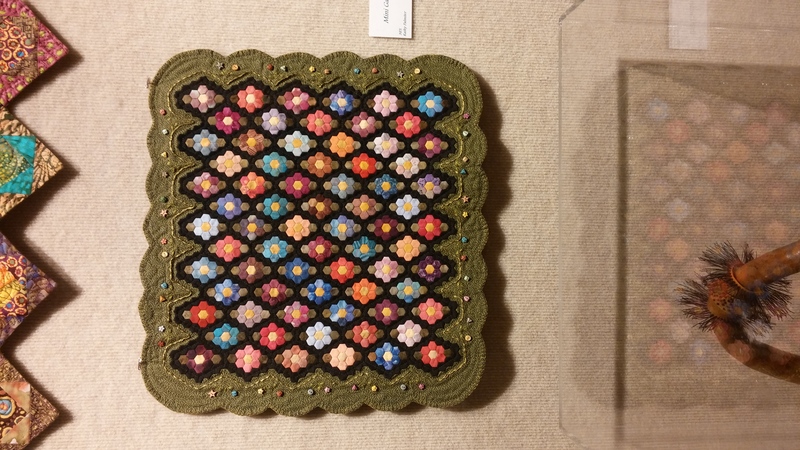 I like this little quilt with the tiny hexagons in a flower garden quilt. 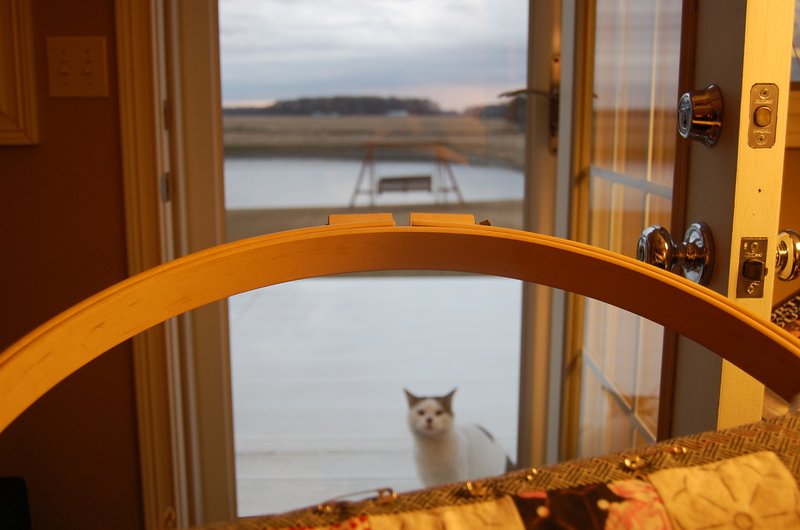 Oh and the play was the title of this blog post-His Eye is on the Sparrow. It was about Ethel Waters an African American singer. It was a one person musical biography starring Mikki White. She was fantastic and I ran a whole gamut of emotions during the two hour show. I was so glad we went. A lovely little red and green minature. Another miniature, the star looks like watermelon fabric. A rendition of a mariners compass with sailboats in the middle and on the corners. 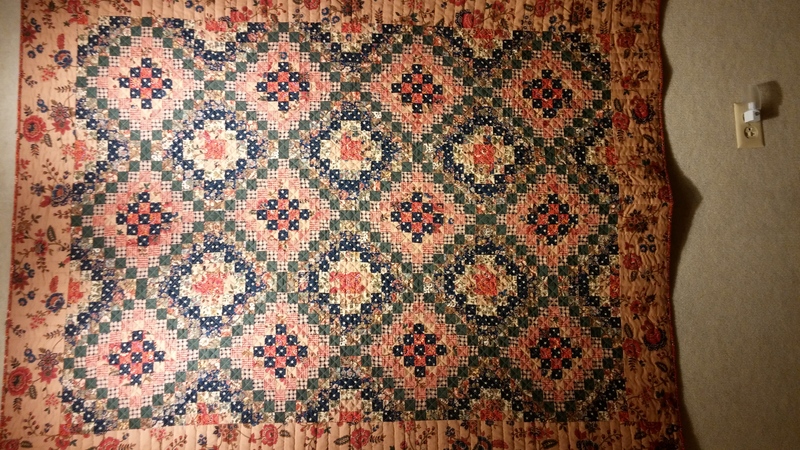 Many, Many tiny squares in this quilt. I loved that this was so colorful. These squares are wonky. I don’t know the names of this one, but it reminds me of space. 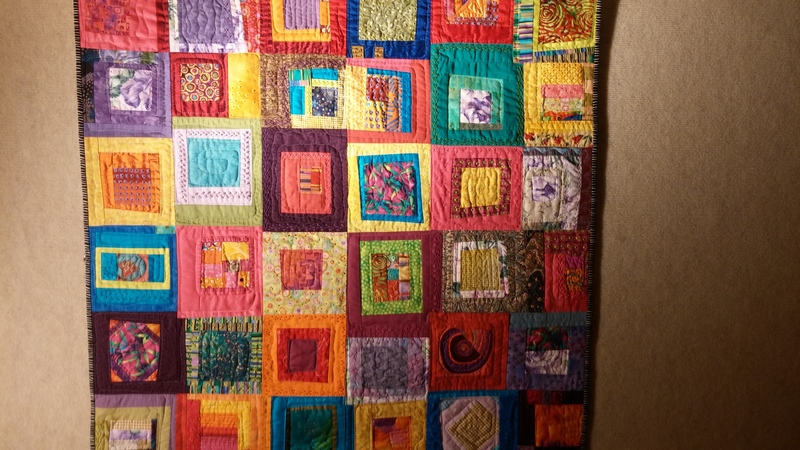 Another colorful and wonky fun quilt. We then went outside and enjoyed being downtown and enjoyed the streetlights and tall buildings and then took a few pictures. It was someplace we were not normally at. 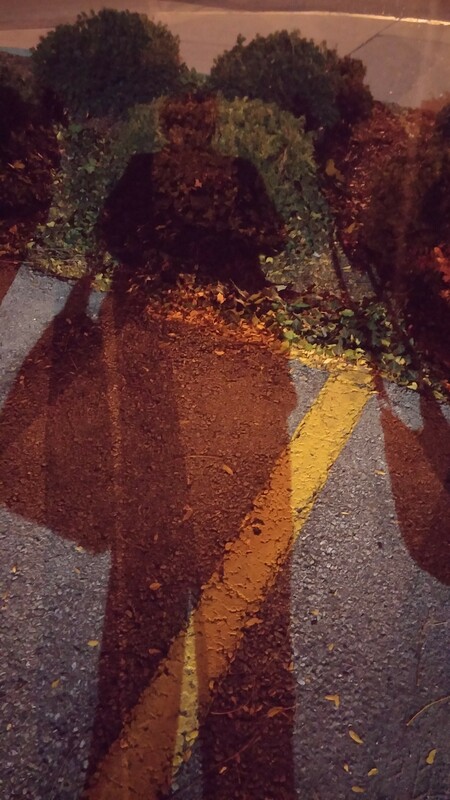 This is my shadow. 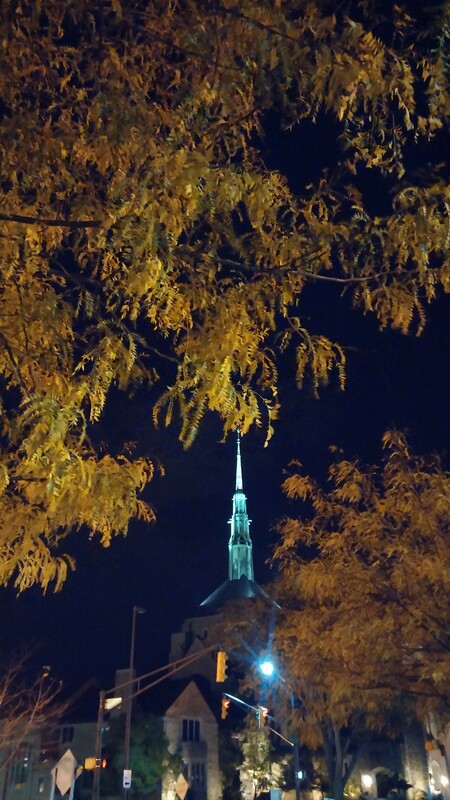 Steeple of the Trinity Evangelical Lutheran Church between the trees. It was all lit up and very pretty. Like I said it was an enjoyable evening, and we are planning our next play to go to there. I wonder what they will have up in the gallery this time. Thanks for stopping! First off with our warm and wet weather my morning glorys will be reaching up to climb soon. The week has just shown a growth spurt. 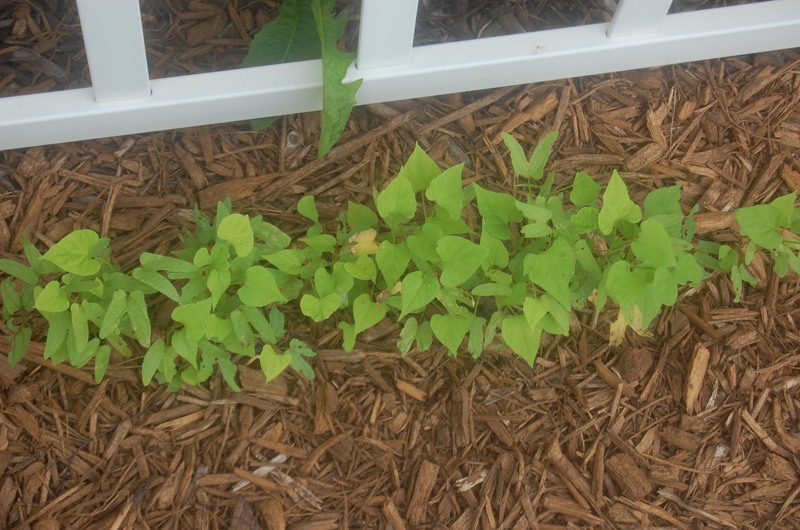 There is a rotten dandelion weed behind the trellis that I just can’t get the roots out and it keeps coming back. 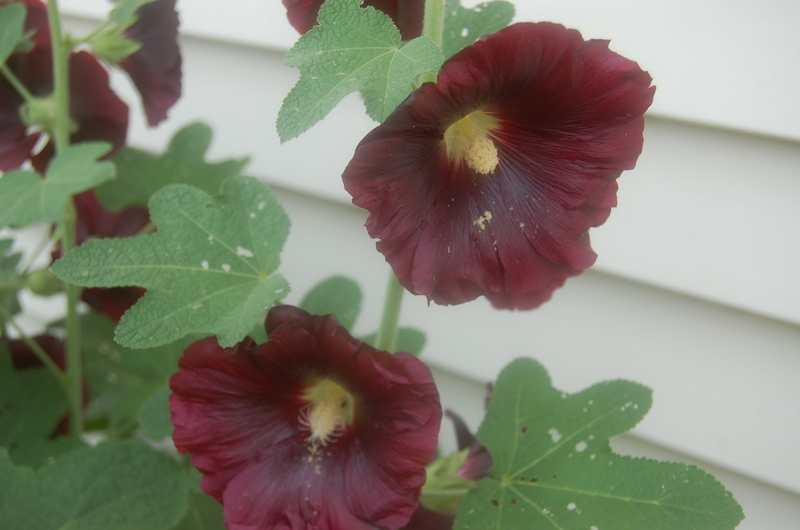 The hollyhocks are putting on a good show this year. I have really dark maroon ones. Also some really light pink ones. 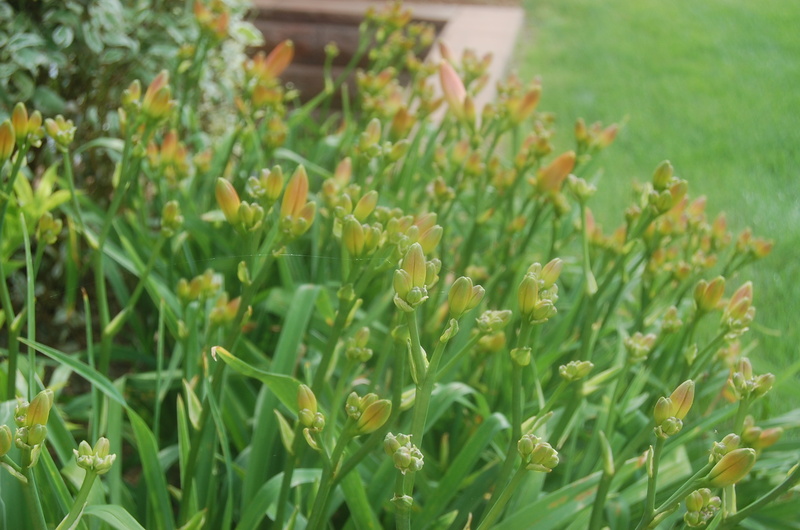 My candystriped daylilies are just going to be a profusion of blooms very soon. They are going to be mighty pretty. 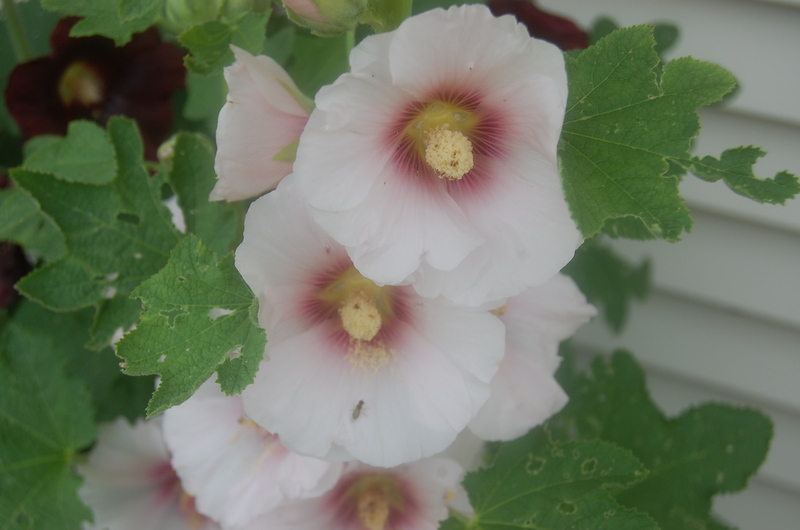 I have several bunches planted around the yard. 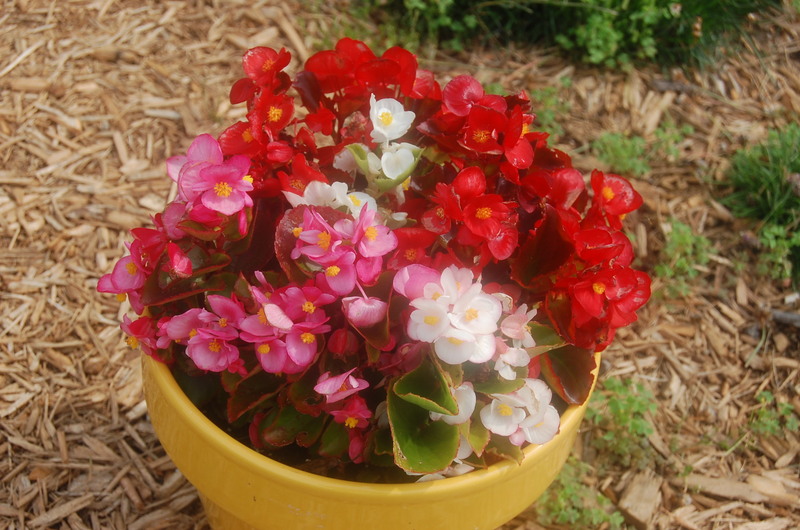 The pots of begonias like the sun and wetness. Full and vibrant these are. I signed up for this online course last October but was not able to participate in it when it opened. 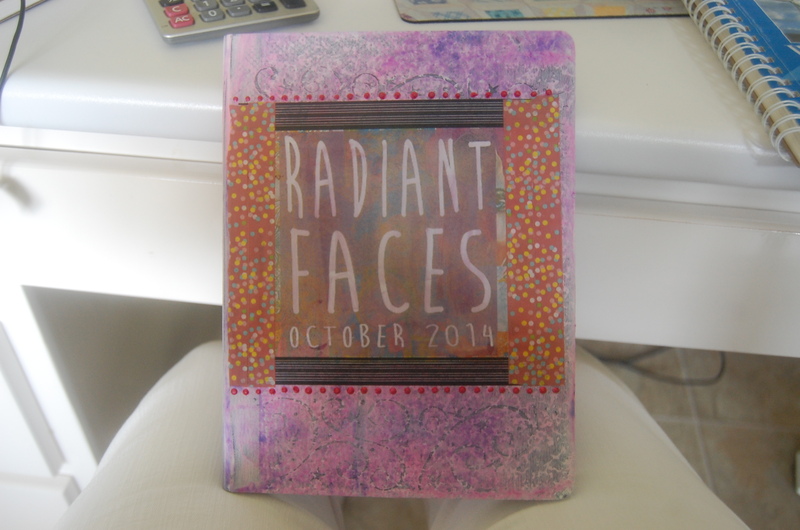 It is still up until October 1st, 2015 and I am going to start it again, possibly today. I signed up because I needed more work with drawing faces. These ladies have different styles and there is a lesson with each one and also Effy Wild who is the wonderful lady that put the class together. 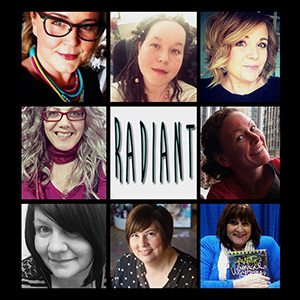 It looks like you can take the course for half price right now and she is putting together a second Radiant Faces Course that will be starting in October. In the first lesson we were to choose a picture to use, so I am that far. 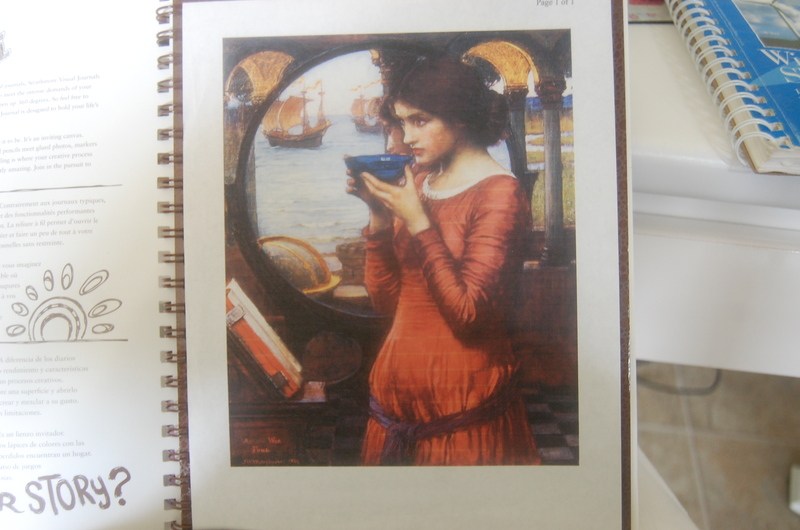 I did get the notebook done though and even made a few for my friends. Yesterday I finished up my Indiana Woodlands poster. 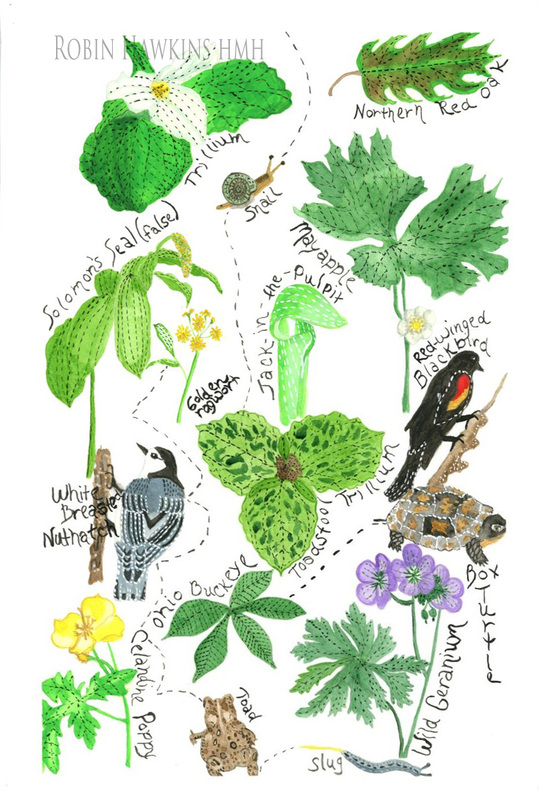 My inspiration was from a biology class that I took, where we tromped around the woods in search of species. 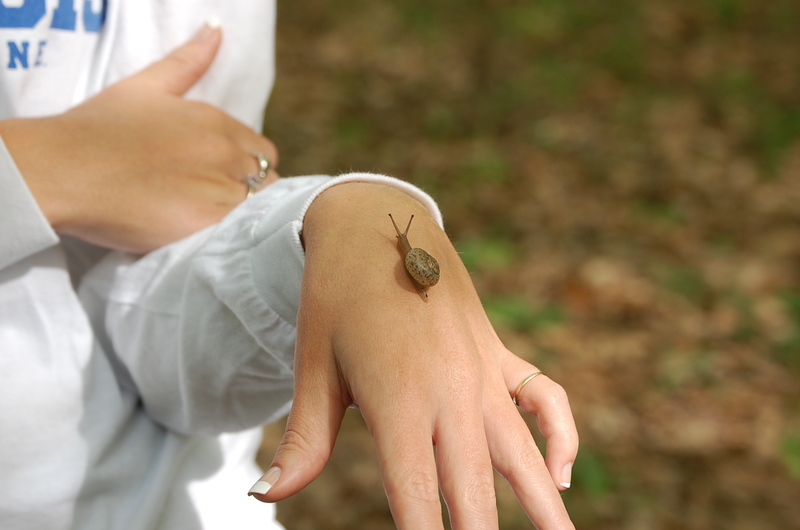 I added some of the critters that we found also. Prints can be purchased in my Etsy shop. All the drawings are from pictures that I took from our journeys. Since I finished my painting I am putting my attention back onto my little quilt so I can get it finished and posted in my shop. I will be adding much embroidery. 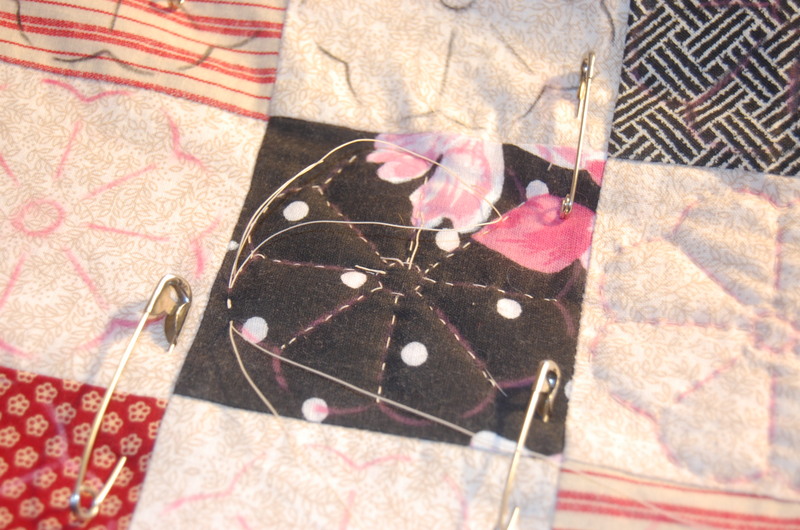 I really love quilting and needlework together. This little quilt is named “Words to Live By”. 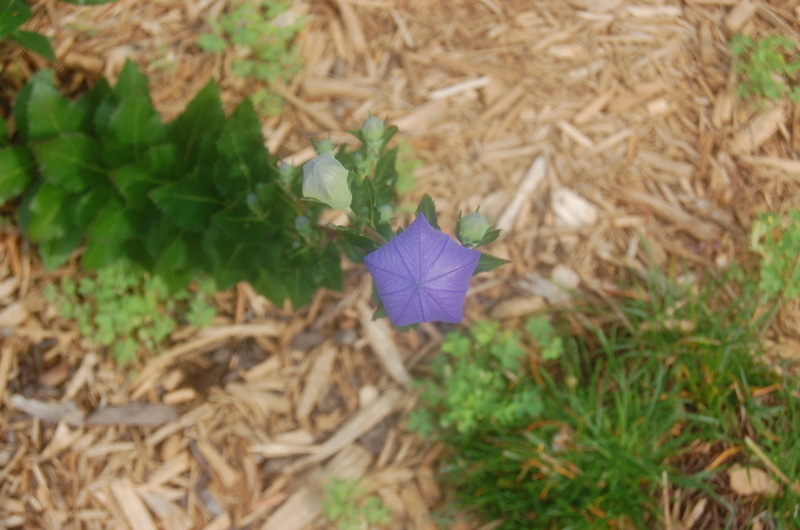 Another flower that is blooming in my garden is the balloon flower. 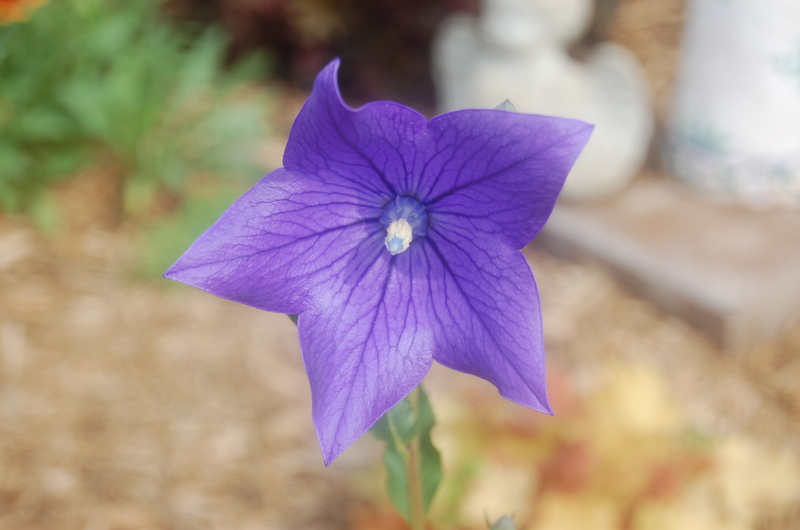 What a wonderful blueish purple. I love the way it blows up like a balloon before it blooms. A decorating project that I am going to start is recovering the dining room chairs. 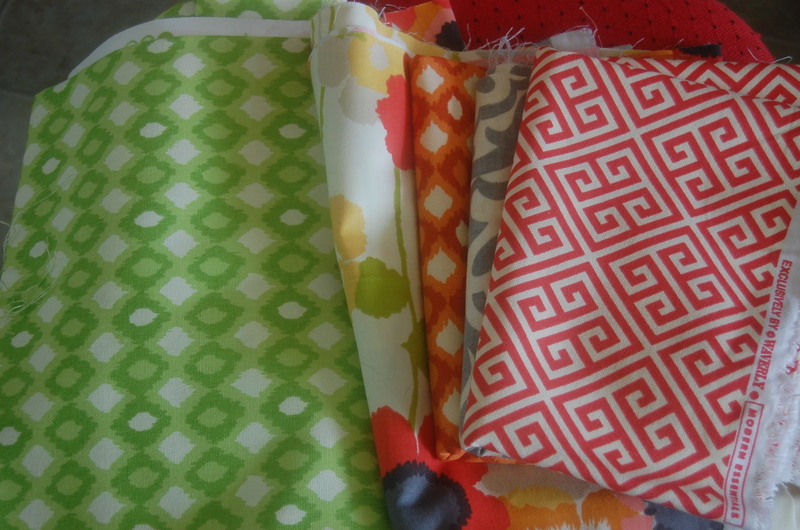 I found this fabric on the greatly discounted rack at Joann’s and it was just what I was looking for. The green will be the chair pad covers and then the others I am making a banner to go at the top of my three windows in that room. I have picked up this book again and have gotten into it. When I finish it I will give it a review. 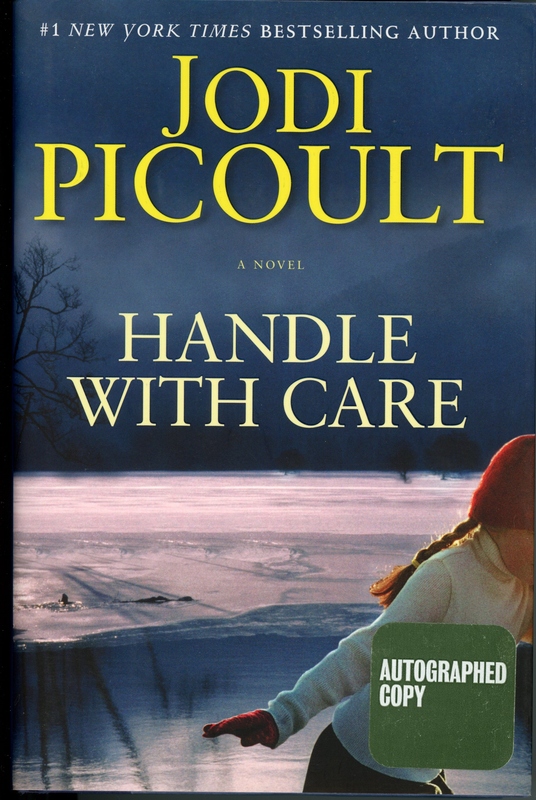 I got an email that this book has shipped. I bet it is out in my mailbox now! Tomorrow my niece Wendy and I are going to his an Antiques fair and an Art fair in Fort Wayne. I also plan to go to the Farmers Market in the morning. I should come back with lots of pictures to share. Hope you have a great weekend! and as always….. Thanks for stopping! 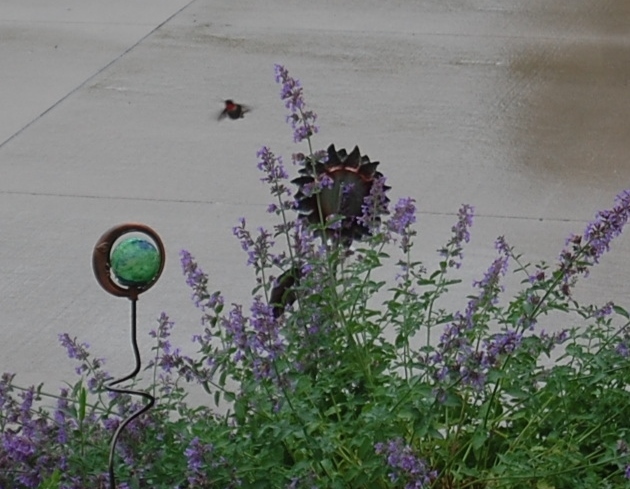 Flights were coming in and out of the catmint area yesterday faster than I could focus the camera. I cropped 3 that we can see pretty well. 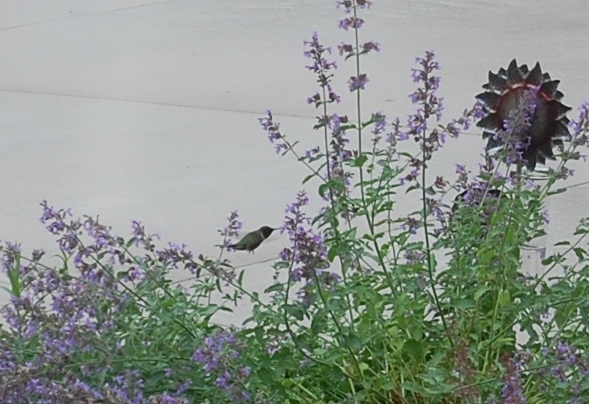 This one is ruby throated. 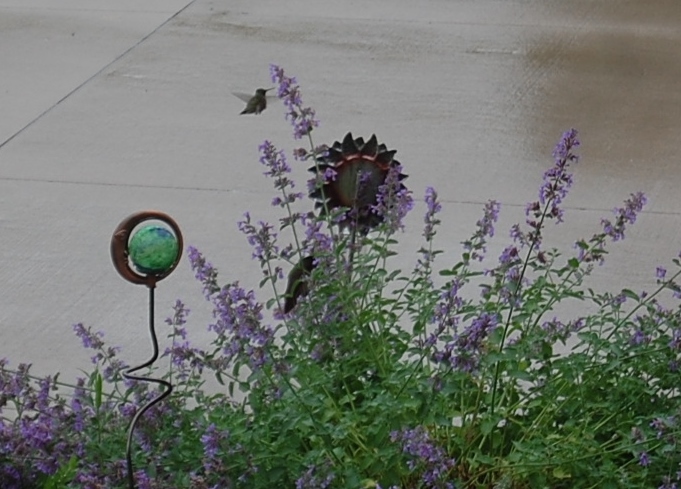 I could just sit and watch them all day! Can see the wings really well on this one. 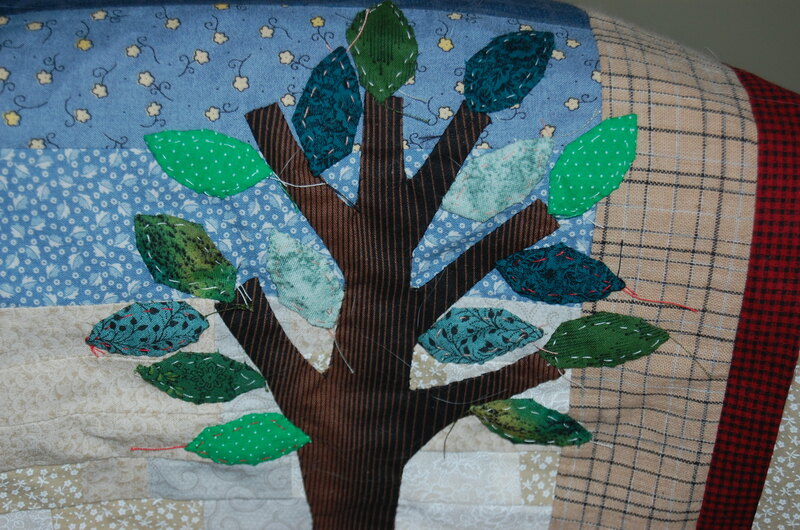 I have been working happily along sewing the leaves onto the tree. It is filling out. I received this succulent from my niece Wendy this weekend. I was just tickled to get it, had been considering picking some up. 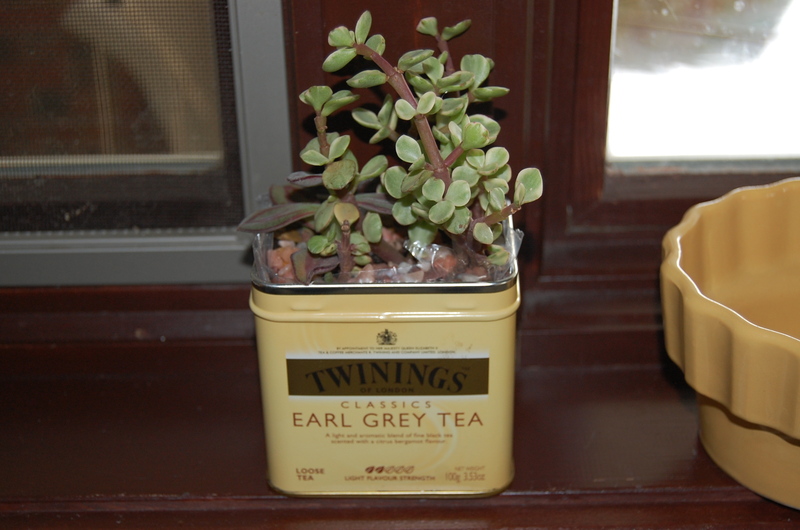 I love the tea can she planted it in and it fits perfectly on my windowsill. 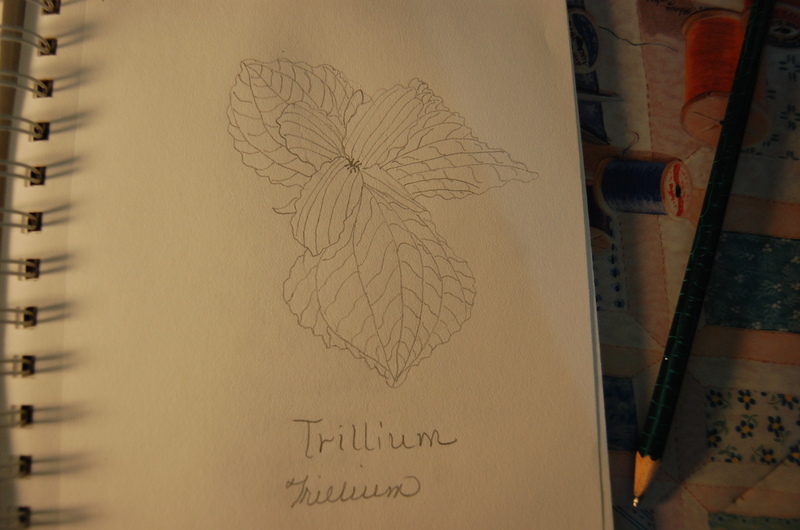 sketching out some wildflowers for small watercolors. 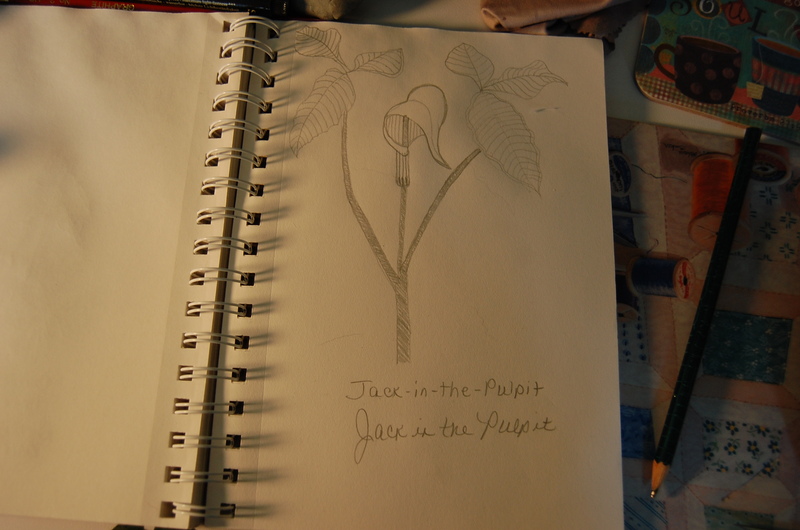 Mr. Jack-in-the-pulpit. Pretty white trillium that should be blooming now in the forests. Going through pictures from this biology class has been a real treat. Thanks for stopping. 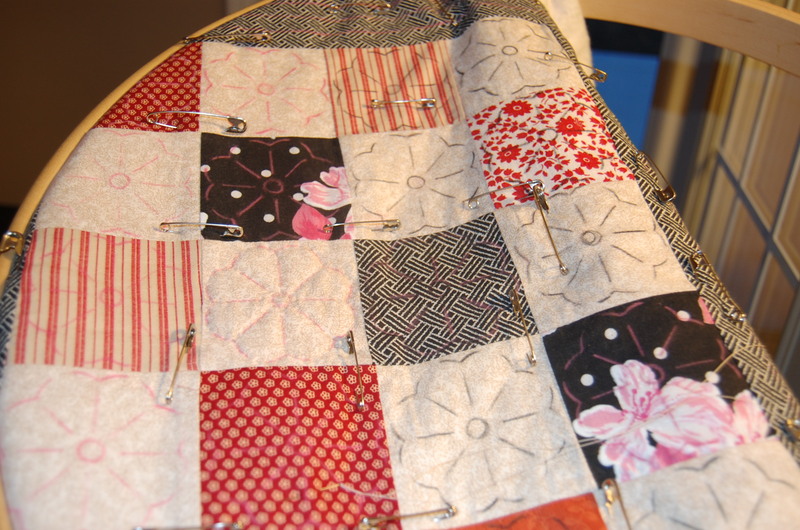 Today I am putting the binding on this little quilt to get ready to put in my Etsy shop. Brushing up on my technique I found the best tutorial on doing this process. I needed to share it. Here it is with the binding attached, no more than one hour later. I now will hand stitch it to the back. This is a great method! Happy Stitching! 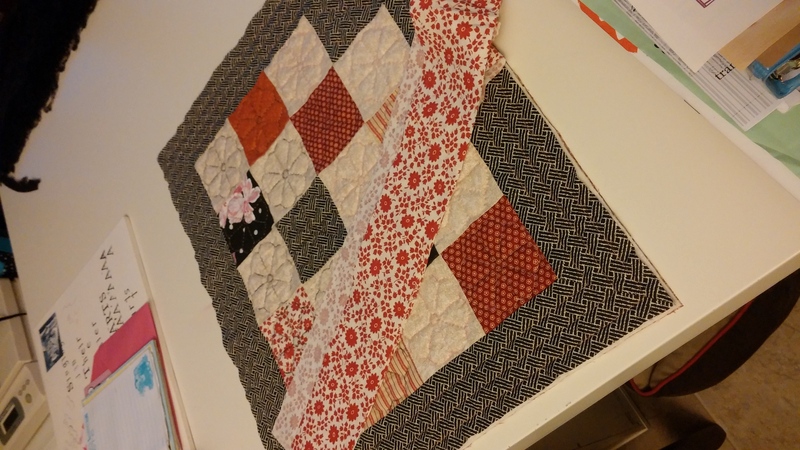 I set up my quilting area for the little red and black quilt. Good lighting, good view, area to put all my tools, out of the way of traffic. Oh, that hat on my chair is one to walk in the woods. I don’t want little buggies in my hair. It was just a good place to hang it. 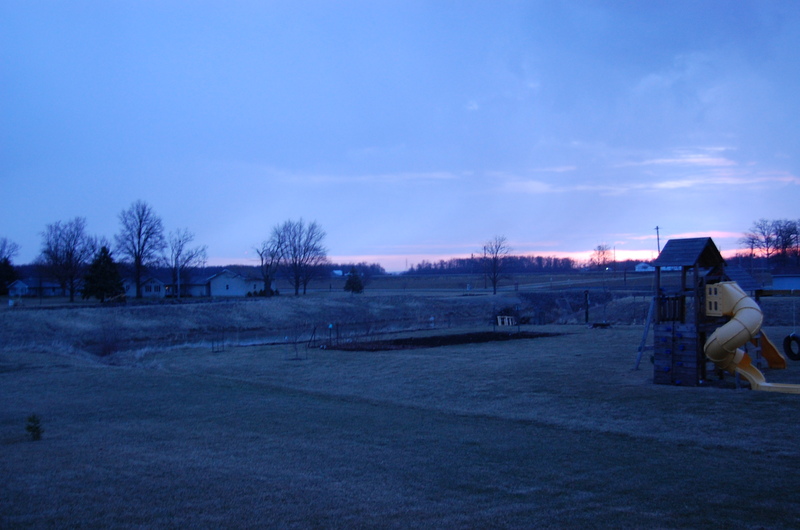 Looks like it is not going to be a very sunny day, but it’s early yet. 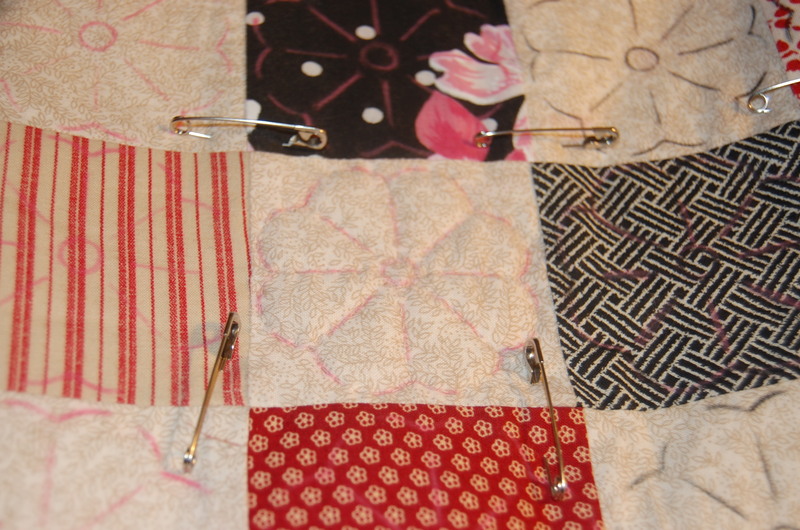 Last night I marked all my quilting lines with washable pencil and a stencil. It should be very pretty with flowers filling up each box. 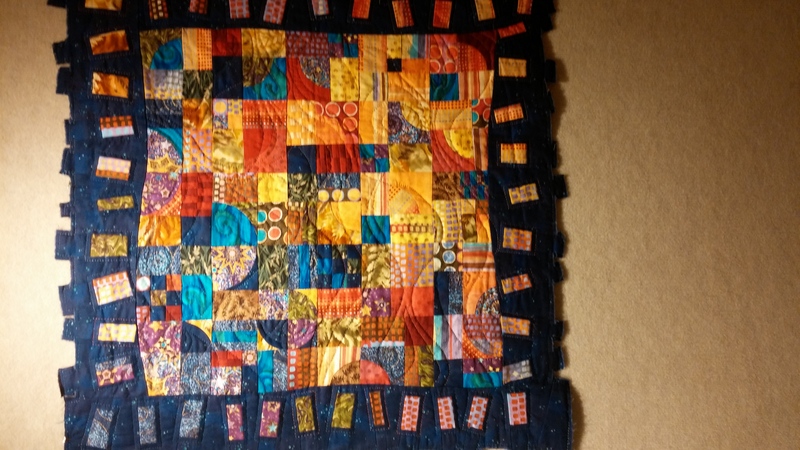 I like a lot of quilting so that it looks full and feels sturdy. After I get it done I will wash it on the hand wash cycle and air dry it with very mild detergent. 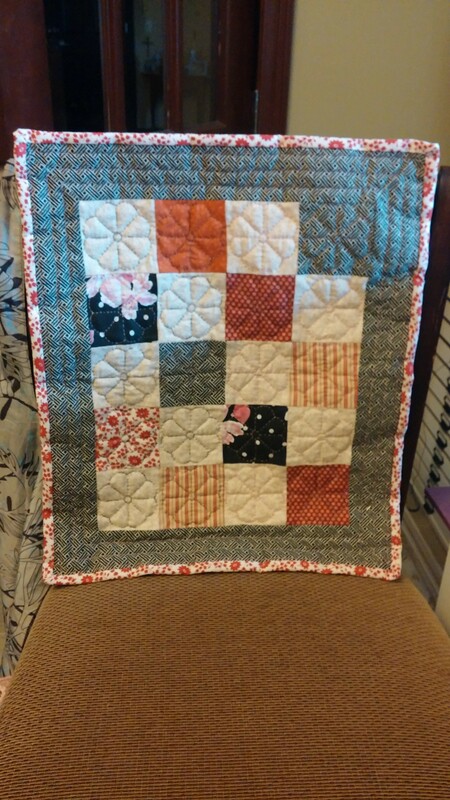 I really love to hand quilt and love the feel of it. I am not a perfectionist and the size of my stitches does not consume me. I want the design to complement the quilt. I want to make sure that the stitches show up really well on the back to make it pretty. While I am happily stitching away I come up with quite a few ideas, not that I am solving the worlds problems by all means. 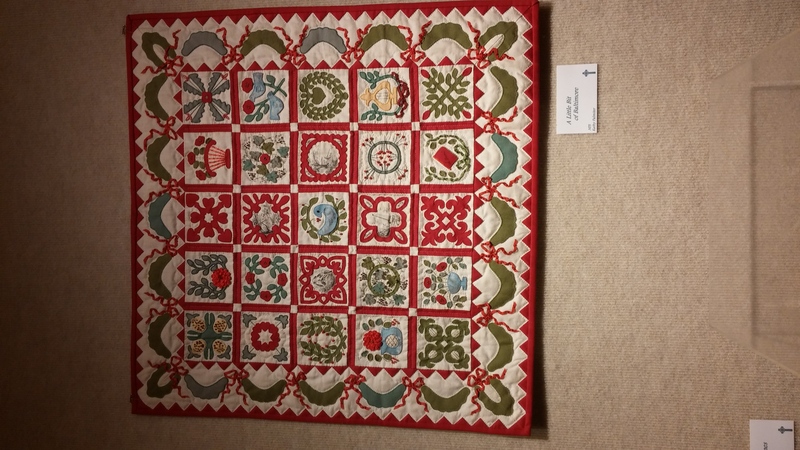 One idea was to do a search on hand quilting to see if it is still popular. There were an infinite number of sites but I found this blog particularly interesting. So I bookmarked it to come back to it. 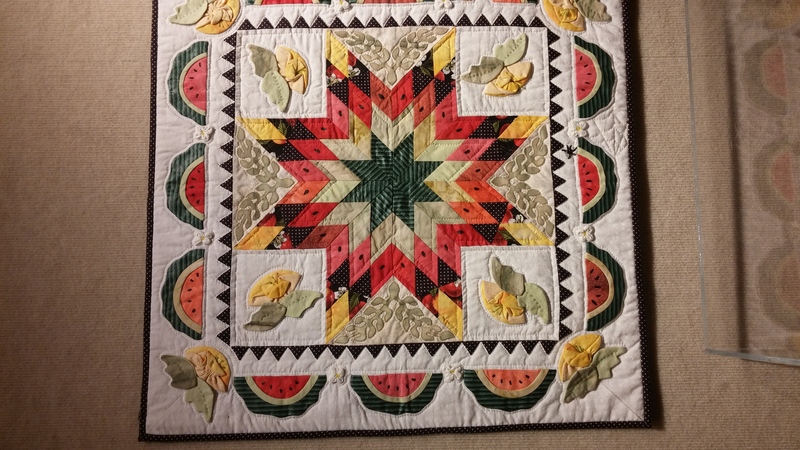 It is called Celebrate Hand Quilting. In the 1800’s and early to mid 1900’s the amount of stitches per inch seemed to be very important. For example 13 stitches to an inch seem to be a number that was to be accomplished. The ladies must have pulled the thread up and then put it straight back down to achieve this number. I just do a running stitch and make three or four stitches to an inch. A few pictures and links of my tools. 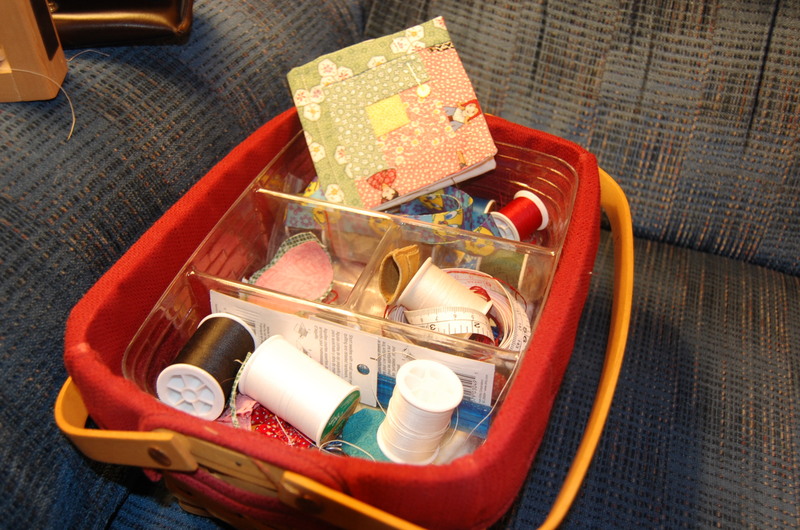 Lots of goodies in my Longaberger sewing basket. 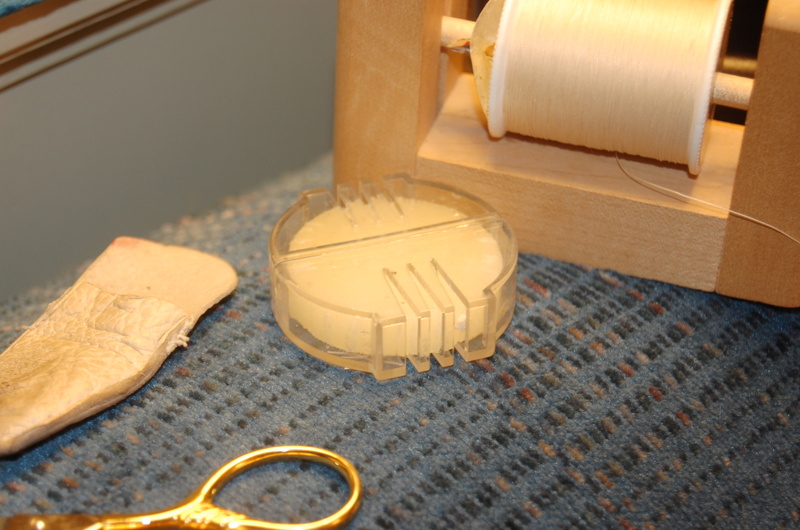 My needle keeper, other thimbles, some applique pieces I am working on and different threads and scissors. One is on a tweety-bird lanyard, easy to find when it has fallen down in the couch. 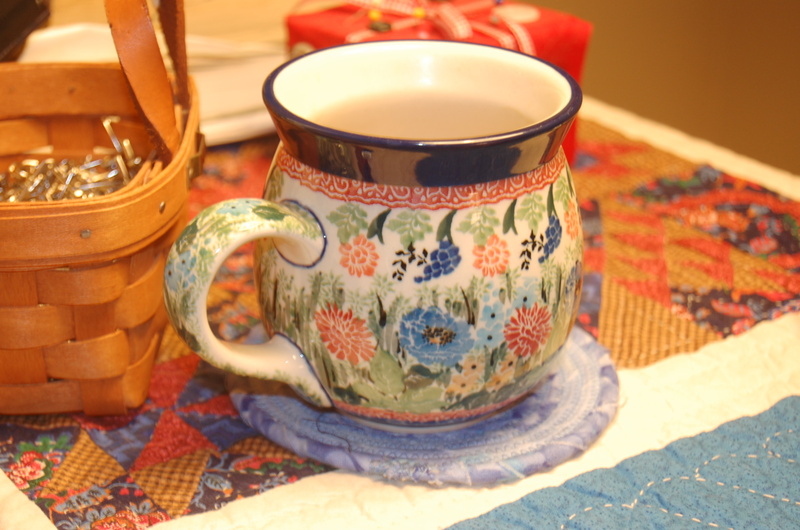 I have various thimbles that I have tried. This is one of my favorites. It is called a skin thimble. It is so soft and fits around the finger quite well with a piece on the inside that shields the finger. I have various scissors like all sewers and quilters. I think that these are just beautiful. 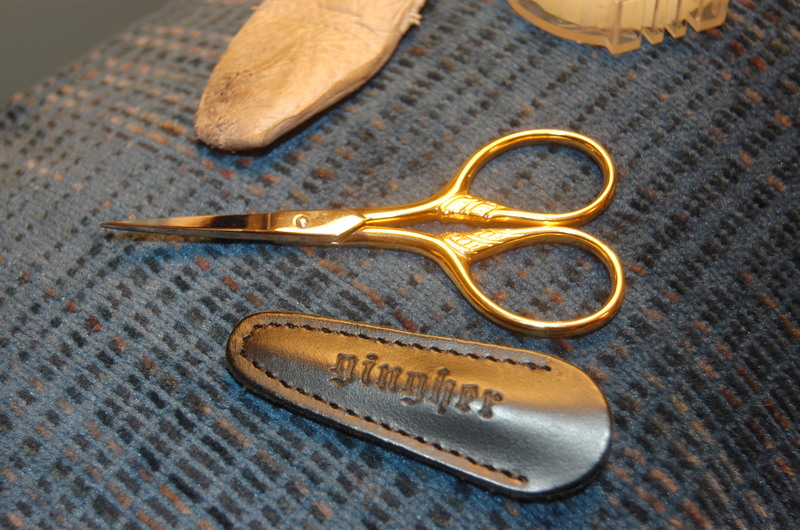 They are lion tail scissors by gingher. Next comes my bees wax. It keeps the thread from tangling. 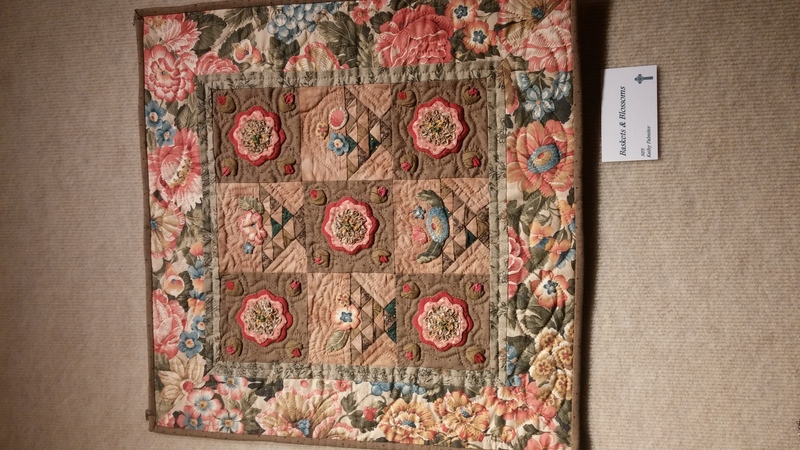 Here is a quilter’s message board asking about it. 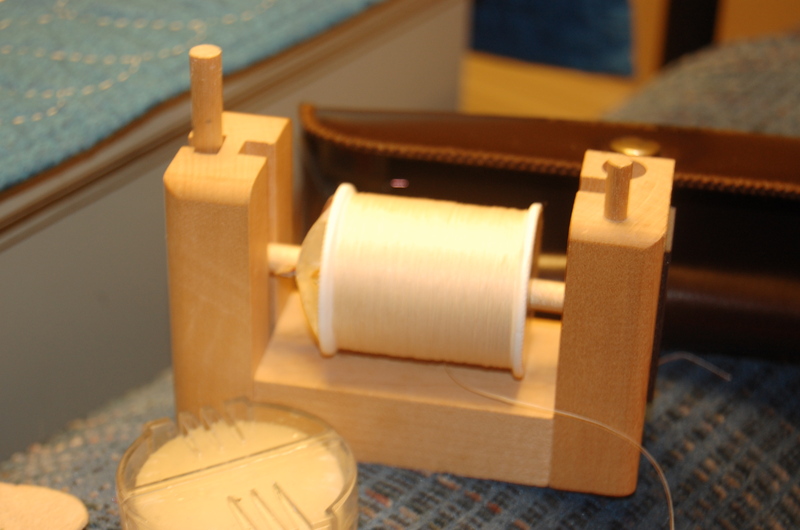 This is the June Tailor thread holder. I like it because it rolls easily to take some thread off. 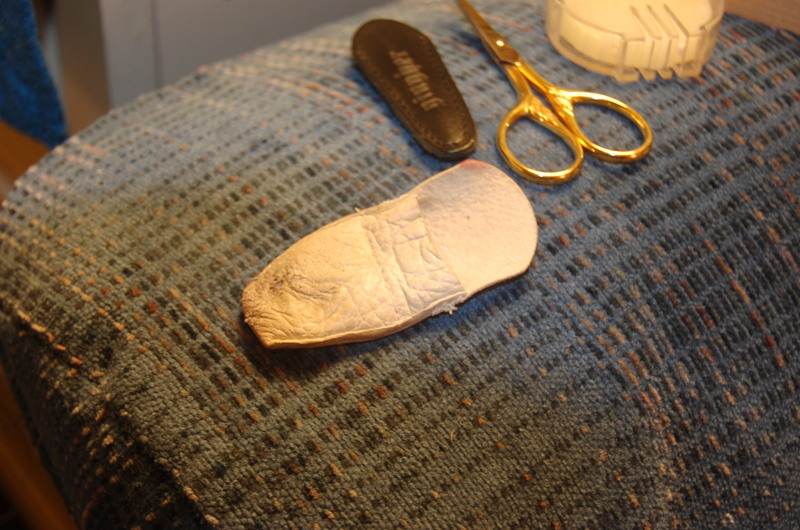 It also has a magnet on the side, some spots to put maybe a seam ripper, a thimble and whatever you can think of. I did a search and not sure if these are made anymore. If not, do a search on Ebay. A cup of coffee in one of my favorite cups. 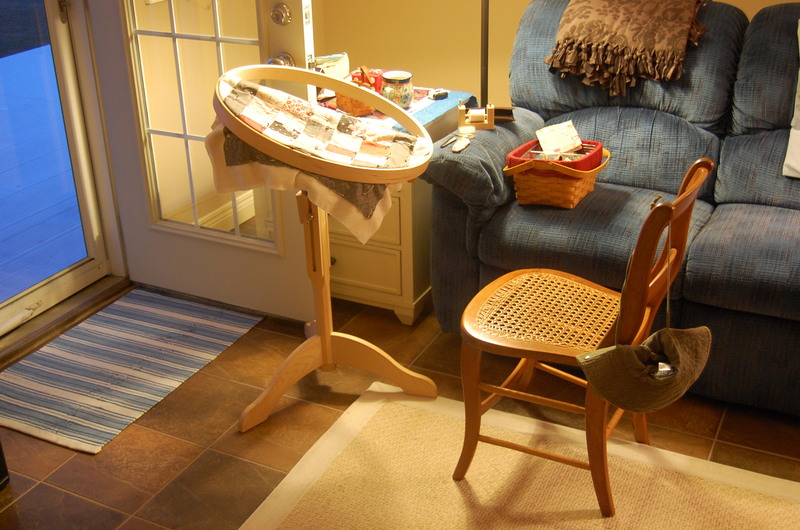 This is the make of my quilting stand. I love this chunk of wood. It is so sturdy and I have had it for quite a while..maybe 20 years at least. 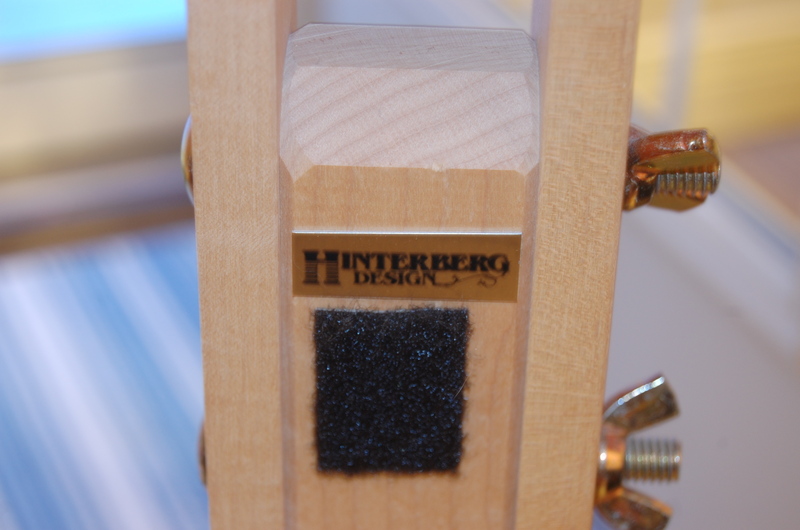 The name of the company is Hinterberg and I picked it up at an American Quilt show in Grand Rapids Michigan. The little tool attaches with velcro to the stand. 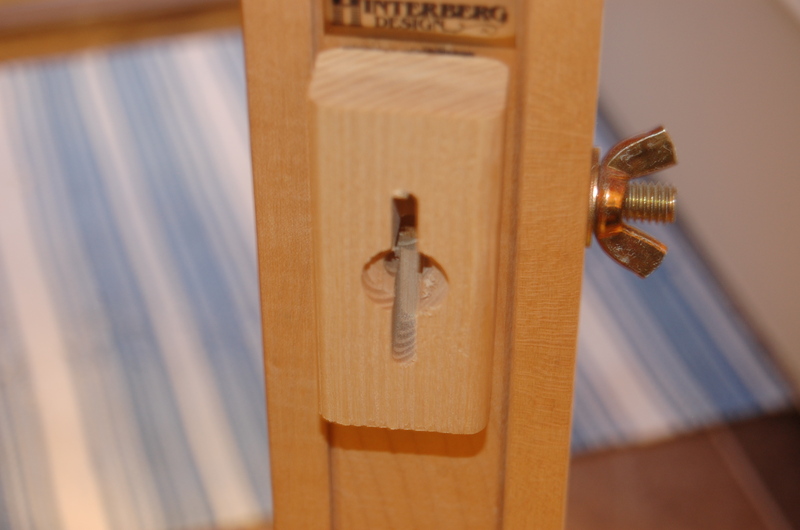 It helps loosen or tighten the wing nuts if need be. It is made of hardwood ash. 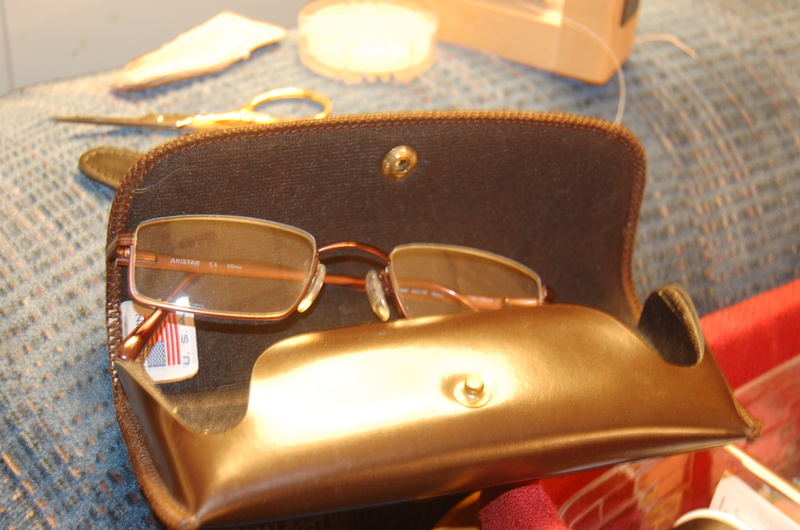 My reading glasses or close work glasses. My husband gets a kick that I have three different pairs of glasses. Close work, computer and then church or shopping glasses. Someone has found me. Looking in to see what is going on. 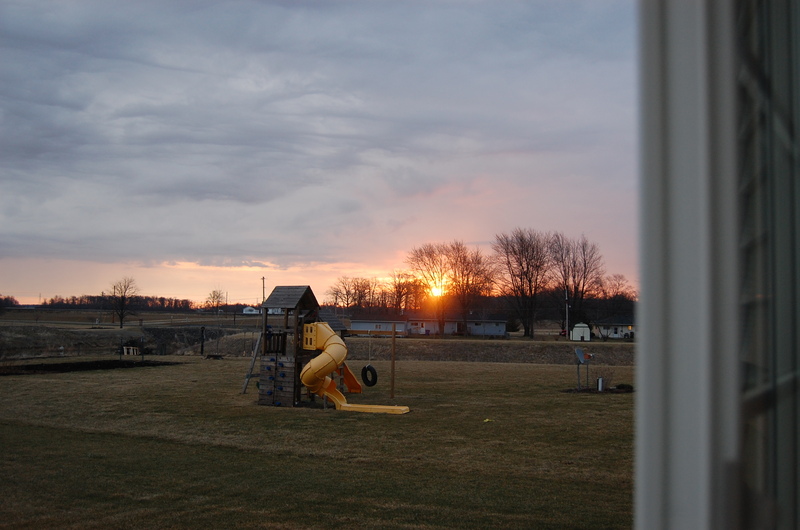 Here comes the sun peeking up. Remember to snip your threads as you go along. It’s a pain to have to go back and try to find them. Do it because you like it, if not you can always have someone machine quilt your design.